Baobab Ingredient Market size is set to exceed USD 5 billion by 2024; according to a new research report by Global Market Insights, Inc.
Increasing consumption of healthy and organic food & beverage products with rising awareness of health benefits from baobab ingredient would propel market growth. Rising demand for the product due to its unique flavor, fine texture in confectioneries, nutritional benefits and its flexibility to be utilized in several products including dairy, beverage, functional foods and bakery would further fuel global demand. Global baobab ingredient industry from oil is likely to witness strong gains at over 3.5% during projected timeline due to its authentic handmade manufacturing process which keep vitamins and essential minerals intact. The oil is incorporated in various cosmetics & personal care products due to its nourishing and healing qualities for dry, chapped & damaged skin. It also prevents stretch marks and fights early aging sings thus propelling market growth. Rising disposable income and higher purchasing power ascribe to be a major growth factor for baobab ingredient industry. It is extensively utilized for making smoothies, juices and consumed in form of ice-creams, cookies and jams thus driving product demand. High prices of ingredient in comparison to other products with high antioxidants and vitamin C along with less consumer awareness towards product might hamper baobab ingredient industry growth. High production cost due to massive transportation cost with labor-intensive industry is another restraining factor. It can be overcome with growing investments by manufacturers to develop its new application & product portfolio. Global conventional baobab powder industry size is set to exceed USD 2 billion by 2024. This growth in demand be attributed to good functionality of ingredient and its utilization in niche product applications along with high pricing. It is considered of the finest quality due to its premium texture and taste. Global baobab ingredient demand from beverage applications may exceed demand at over 35 kilo tons by 2024. Beverage intake ensures the high consumption of antioxidants and nutrient rich components compared to other ways of intake. It contains vitamin C, which minimizes the risk of chronic diseases due to its antioxidant properties. It is also medicinally beneficial for mosquito repellent, asthma, and for allergic skin conditions thus driving industry size. Asia Pacific baobab ingredient industry sized to be over USD 650 million in 2017 and is anticipated to exceed USD 950 million by 2024. Countries including Japan, China and India are major consumers of nutraceutical products along with being a major hub for functional food & beverage industry thus driving product demand. 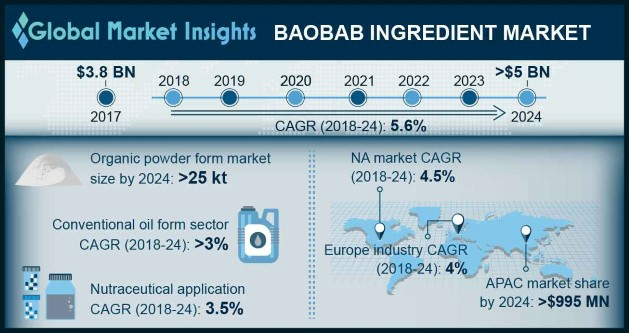 Europe baobab ingredient industry driven by Germany, UK and France may register strong gains over 4% during projected timeline due to its increasing consumer awareness for health benefits associated with product. Consumption of ingredient protects from chronic disease, ageing and contains low calories when added to beverages. Key industry players have added baobab to their recipes and are developing wide product range. Rising consumer acceptability for organic and healthy foods which may drive regional industry size. Global baobab ingredient industry share is competitive and moderately fragmented with key players including Afriplex, Mighty Baobab Limited, Aduna Limited, and B'Ayoba (Pvt) Ltd. Other market participants include Atacora, Woodland Foods, Halka B Organics and Indigo Herbs Limited. Manufacturers are entering into strategic alliances to increase its product accessibility by sourcing the fruit from Africa by coming into long term contracts with suppliers. They are also increasing investment in R&D to enhance its product innovation and portfolio.